Mon., Oct. 24, 4 p.m. "New Perspective in Understanding Magma Sources and Differentiation"; Olin Auditorium. Tues., Oct. 25, 4 p.m. "A Volcanic Odyssey: Travels in Search of How Volcanoes Work"; Olin Auditorium. Wed., Oct. 26, noon. "An Introduction to Damavand Volcano, Iran"; 304 Olin. Thurs., Oct. 27, 6 p.m. Lecture and book signing with photographer James DuSel and author John Dorsey to celebrate the release of their book Look Again in Baltimore, published this month by JHU Press. $6, $5 for senior citizens and students, $3 for children; free for JHU students, faculty and staff. Reservations required. Evergreen House. 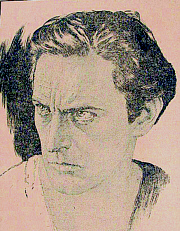 Actor John Barrymore is the subject of an Arts Certificate final project. See Theater. Tues., Oct. 25, 1 to 4 p.m. "Getting Started: Content and Communication in WebCT," Garrett Room, MSE Library. Thurs., Oct. 27, 1 to 4 p.m. "Faculty-Directed Training," Garrett Room, MSE Library.